spend the evening just a few of us girls are going to have a "[illegible ing?]" My [illegible?] is all [six? illegible] "[illegible]". You don't know how much I love you all. I never knew myself till now. You all think me not capable of love I believe. Since [illegible] I have [illegible] will [contain?]. Would love to see you all but have not been really [illegible] I would [illegible] since that. 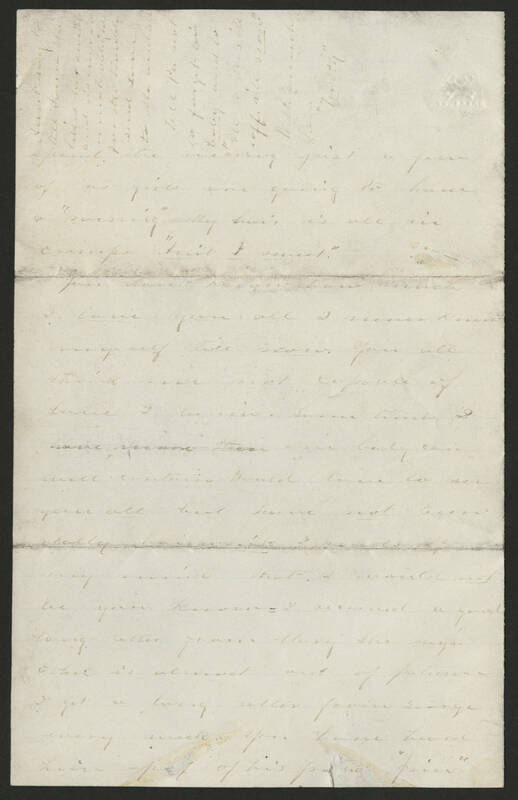 I would [illegible] be [illegible] known = I received a good long letter from [Mary?]. She says Ethel is almost out of patience. I get a long letter from George every week. You have heard him [speak?] of his [f??tic?] "pain" [top of page: additional sideways writing:] [Ausel?] say to tell [Laura?] [illegible] likes his [sweets?] and is ever so much obliged for the trouble [send? since?] [Lucie?] to [illegible]. Tell Pa not to forget his baby and to "[ilt to his ilt-off, i'to now?]". With so much love, "Trotty"